This has been a busy time, with some long-term artistic projects coming to fruition and others popping up out of the blue. I like to track these on this blog, although it does seem like recently most of my writing here has been about various artistic projects and less about ideas and current events, which is what I generally write about. Oh well… All I can say is that these artistic projects are all directly related to the overall theme of this blog, which is the myriad ways we are defined by the media we use to communicate. An example of this is another project that I am happy to unveil here today, one called Conversations, that I created in collaboration with print artist Paul Ballard. Or perhaps it would be fairer to say that he created it in collaboration with me, since he did the bulk of the work. 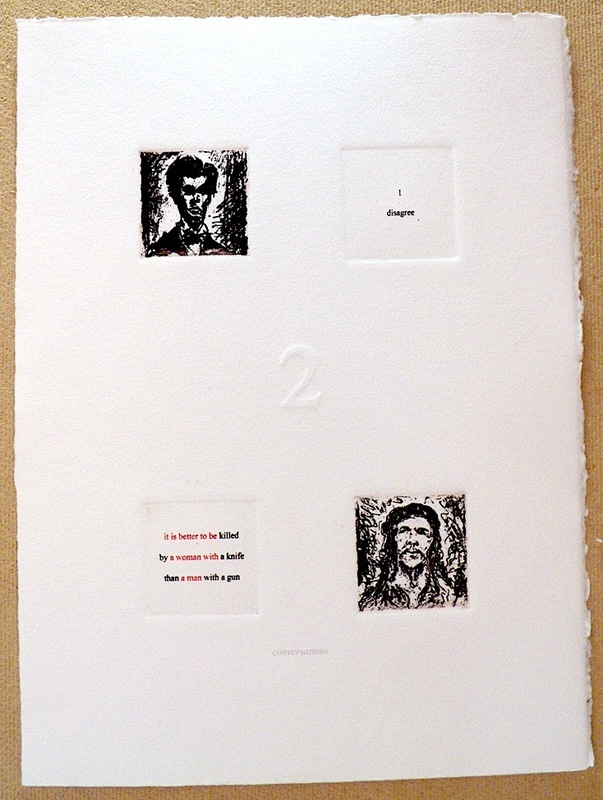 That is to say that while I was the writer, he was the visual artist and printer, and printing by hand, especially carefully produced limited edition prints on fine paper, is a very time consuming process indeed. Still, it was a successful collaboration, and now that Paul has completed some of the edition and copies have been deposited at various official libraries, I thought I would share it here. Paul was given my name through a mutual friend. 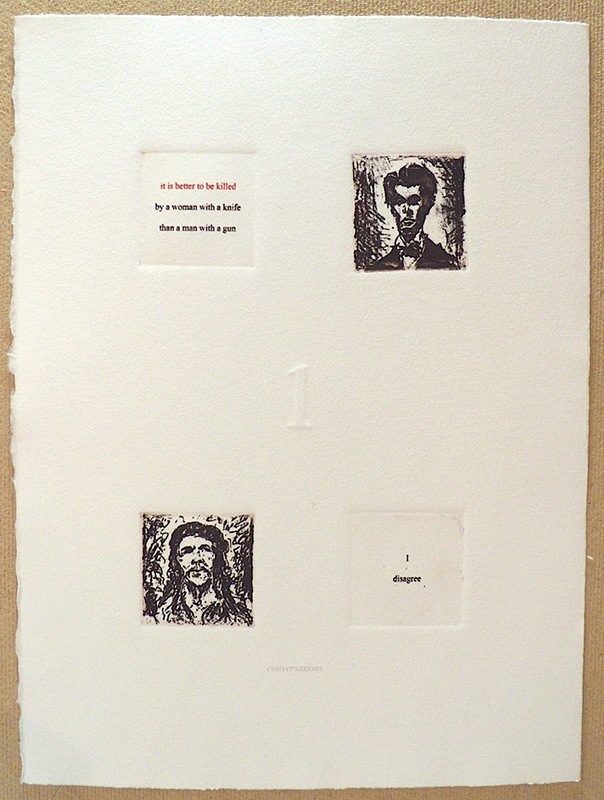 When he approached me with his idea for a series of prints that would somehow represent a dialogue between Che Guevara and Abe Lincoln, I was intrigued. And as usual, since I always enjoy new creative challenges, I said I’d give it a go. So I pondered and scratched out various possibilities, and casually read through various texts by and about Che or Abe, wondering what the most suggestive, poetic and concise way of connecting these two men across time and history could be, until one day I hit on something that I just knew was right. It was a quote, by Che, in reference to his trip to New York City in 1964 to address the United Nations’ General Assembly. It seems that while he was in New York there were two attempts on his life, one by a man wielding a gun and one by a woman with a knife. When asked about these attacks by a journalist, he is said to have responded with a smile and a bemused wisecrack: “It is better to be killed by a woman with a knife than a man with a gun” said Che. As you can see, I thought this phrase had the potential to be mashed up in various ways. I won’t show you the final two prints – you’ll have to purchase the set for that! – but I think you get the idea. By adding the phrase “I disagree”, I think I was able to bring them into conversation in a way that reflects their highly argumentative natures as well as the complexity of their lives and fates. That’s what I was aiming for anyway. I’m very pleased with how the project turned out. I hope Che and Abe might enjoy it too, and perhaps you too. I believe the series is to be exhibited later this year in a gallery in New York though I don’t know which at the moment.